Could “unconsciousness” in your relationship be a block to intimacy and passion? Do you value your relationship but want more from it? Would you like your relationship to become the vehicle of your personal and spiritual growth and your personal and spiritual growth to become the vehicle through which you create an intimate passionate Conscious Relationship? 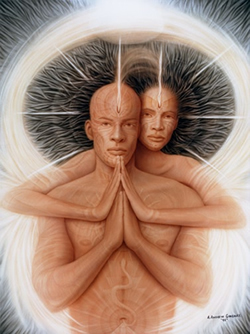 What Is A “Conscious Relationship? In a Conscious Relationship, the two people involved are on a path of growth. They are no longer controlled by their own and each others unresolved childhood feelings and limiting beliefs, which previously triggered frightened and anxious emotional responses to things in the present and in their relationship. They support one another in dealing with their feelings and progressing down the path of growth. We will help you form an evolutionary partnership for the purpose of creating a conscious relationship in which you and your partner are no longer controlled by your own and each others’ past conditioning, repressed fears and feelings, false and negative beliefs, unworkable life decisions and defense strategies, and the uncomfortable, self-fulfilling life scripts that arise out of all of this to the disadvantage of yourselves and your relationship. We also help you deal with familiarity, boredom, and stressful business by bringing into your relationship intimate conversations, compelling encounters, deep sensuality, invigorating separations, and the capacity to balance love and companionship with freedom and autonomy. Click here for more information about Private Consultation. Our next webinar series: Pathway to Intimate Passionate Love – Evolutionary Relationship. You are having arguments and fights, and the same old issues keep re-emerging. You push each others’ buttons and react to each other when that happens in the same old alienating ways. You blame each other for your disappointments, frustrations, and feelings. You sacrifice a significant amount of who you are and what you want for your relationship. You don’t have much to say to each other beyond organizing your life together. Fun, pleasure, play, creativity, relaxation, stimulating experiences – either alone or together – are far too rare. You don’t have a balance of separateness and togetherness. You’re always too tired or too busy for quality time with each other. Your appetite for sexual love is no longer a powerful force in your lives and you are not doing anything much about it. The good news is that you can do something about it… You can have the relationship of your dreams! Who are we the most suited to helping… and are you among them? We work with couples, singles, and people who want help without their partner. However, being in a long-term relationship ourselves and understanding the unique problems of couples in long-term relationships, we have a special affinity for working with committed couples, whether they are dissatisfied or cherish their relationship and want to optimize it. If you are in a committed relationship, ask yourself if any of these situations might apply to you. These are the people whose lives are focused around their work and have difficulty finding time for their relationship. These are people who are in a great place with each other and who want to take it higher. You are still in the honeymoon period and the magic is still there but you have seen what happens to relationships over time. There is a passion that is shared by you both and you want to become the best lovers you can. Those in this stage of life are facing both social messages about what is possible after 50, their changing bodies, and their decreasing libidos. Having a strong background in natural health in general, and sexual health specifically, we have a special interest in helping people of all ages dealing with health problems that lead to sexual health challenges. Single people who want their next relationship to be a lasting intimate passionate love and who want to prepare themselves now – mentally, emotionally, sexually, and spiritually. If you want your next relationship to be different, you have to be different and you have to know what it is in yourself and others that blocks you from fulfilling your relationship dreams.